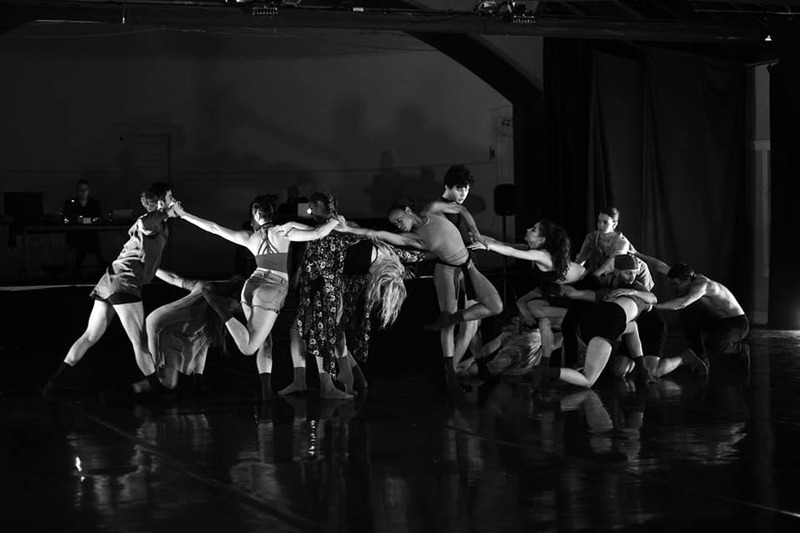 Article by Sarah Perry Wilson, reviewing Elements Ballet’s performance of SOAKED | SURFACE, Friday, February 15, 2019 at Hamlin Park Fieldhouse Theatre. There is something about an Elements Ballet performance that makes me feel like a dancer. Not just wish I was a dancer, but actually feel like one, from the first steps of choreography until the company takes a bow. Watching Elements, there is something very evocative of everyday movements, feelings, expressions, even tasks. Human experiences, from the mundane to the profound, are stripped down to their essences by the choreographers, then performed with authenticity and heart by the dancers. While maintaining the poignancy of classical ballet, Elements brings dance into the tactile realm that all people inhabit, not just the dancers among us. Their movements appear natural and expressive – usually graceful, sometimes purposely not so – and so relatable that someone like me is momentarily transported into the more capable bodies of others. How can a performance actually make an audience member feel like an artist? After seeing the company’s recent improvised performance, SOAKED | SURFACE, I have a theory about what is going on, and it has everything to do with improvisation. Elements has a longstanding tradition of incorporating guided improvisation sessions into its rehearsal process, referred to as Water Class in the language of the company. Emulating the changing and flowing qualities of water, this practice encourages the company’s dancers to explore a fuller range of movement than any single dance tradition typically incorporates. 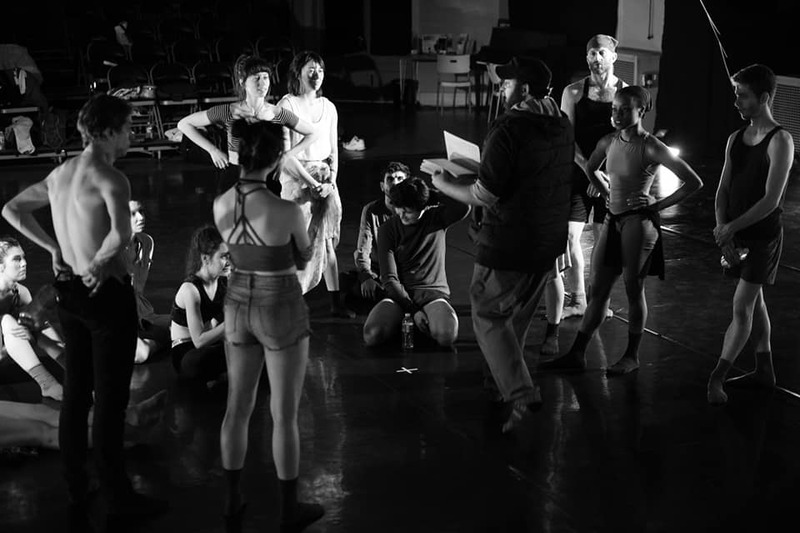 Co-Directors Mike Gosney and Joseph Caruana encourage the dancers to move beyond grace and beauty, translating whatever feelings and experiences they are carrying with them into movement. Aspects of this improvised choreography make their way into Elements’ original repertory, and the improvised origin of movement is what allows people like me to see echoes of our own lives and bodies in the work. With two performances at Chicago’s Hamlin Park Fieldhouse Theater, SOAKED | SURFACE was the company’s first-ever fully improvised, evening-length production. It was an important milestone for Elements: in conducting research prior to marketing the performance, Elements was not able to find any examples of similar programs that have taken place in Chicago, or even in the U.S. The title of the program makes reference to the presence of water – or improvisation, as defined by the company – as well as the thematic content of the production, loosely structured based on the idea of dancers traversing different landscapes across Earth’s surface. Pausing to imagine the sensations involved in crossing arid deserts, craggy mountains, lush jungles and crowded underground caves, one can almost feel the changing degrees of difficulty and ease, comfort and struggle. In this sense, the theme was perfect for an improvised dance performance, eliciting all kinds of solo and group movement from the dancers and reactions from the audience. To add context to the experience, Artistic Director Mike Gosney spoke briefly before the performance, explaining how the company uses improvisation in rehearsals to encourage dancers’ self-expression, fluidity of motion, creativity, and choreographic skills. He also explained several improvisation games that he uses in rehearsals, and encouraged audience members to watch out for them in SOAKED | SURFACE. For me, having something to look out for helped anchor my attention throughout the performance and added a game-like element to the evening. The production featured the entire company of dancers and apprentices improvising movement to a live score performed by the transcendent vocalist, composer and performance artist ALEXA GRÆ. In keeping with the theme of the evening, the music was also entirely improvised, supporting the natural development of two distinct and unique performances. ALEXA’s score incorporated electronic music and ambient sound, as well as vocals and keyboards. Due to the nature of the performance, lighting was also improvised in the moment. 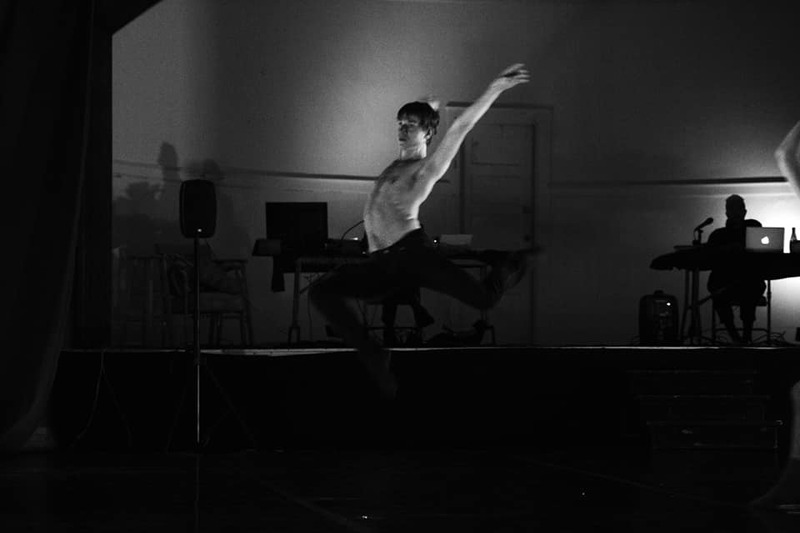 Both the sound and lighting were essential to the experience of the program, and assumed a dancer-like role themselves as they interacted with the Elements artists in real-time. ALEXA GRÆ’s live-improvised score was compelling, varied and rich with rhythm and texture, helping to conjure each landscape and guide the dancers’ movement. ALEXA and the dancers played well off of each other, remaining highly sensitive to one another’s work throughout the 90-minute performance. This was quite an accomplishment, as the performance did not include an intermission and demanded keen attention and awareness from all of the artists involved. Overall, throughout the performance, there was a feeling among audience members that we were experiencing something truly unique and new. The children in attendance were particularly excited by the noises they heard – many vocalized in imitation of ALEXA’s own vocalizations and electronic sounds, and the context of the performance made this completely appropriate. They actually became participants in creating the live-improvised score, adding to the spirit of SOAKED | SURFACE. At the end of the evening, audiences responded with enthusiasm and admiration for all of the improvising performers, and mingled with the artists to ask questions about the process of creating the production. They were especially curious about ALEXA’s performance, the equipment and techniques used, and the inspiration needed to create a musical score in the moment. The dancers I spoke with and ALEXA felt that the second of the two performances was the strongest, noting that the first evening had helped them develop a sense of appropriate timing for each landscape section. They also gained confidence during the first show, which was an entirely new performing experience for them. Based on the success of SOAKED | SURFACE, Elements plans to continue incorporating improvised performances into its programming, sharing in a uniquely Chicagoan tradition common to the city’s theatre and comedy offerings. Its directors look forward to their next opportunity to work with ALEXA GRÆ, now a frequent and well-suited collaborator who shares Elements’ propensity for artistic risk-taking. Personally, I look forward to my next opportunity to feel like a dancer for a day. Photographs of SOAKED | SURFACE by Victor Hilitski. Find Victor on Instagram and Facebook.